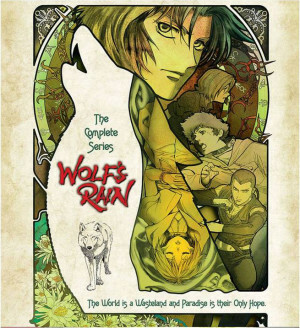 Wolf’s Rain to broadcast on VICE UK. Starting 11th March 2019. The the past year and half we’ve worked with VICE UK to help bring anime back to UK Television. From classics like Cowboy Bebop and Eureka Seven, to recent series such as Tokyo Ghoul, even UK Television premieres of series that were broadcast in Japan just months earlier – Tokyo Ghoul:re and Full Metal Panic: Invisible Victory – making them the fastest transition from Japanese TV to UK TV broadcasts of anime ever! But the fun will not stop there as VICE is preparing to bring another classic series back to the UK television in the form of Wolf’s Rain, the series from the same studio that brought you the likes of Fullmetal Alchemist, Blood Blockade Battlefront, Sword of the Stranger and My Hero Academia. Make sure you keep an eye on the VICE TV guide and their social media channels for more details as they become available. Directed by Tensai Okamura (The Seven Deadly Sins, Darker Than Black, Blue Exorcist). Synopsis: “Paradise – a legend, a myth, and a hopeless dream in a world that has become a wasteland. It is not meant for everyone, only the wolves thought to be extinct yet still roam the lands. When the Flower Maiden awakens, the path to the end will open. If you want to read more about the series, have a read of this piece at our blog by Andrew Osmond HERE. We hope you’re looking forward to watching this!